The very first thing I noticed when I stepped into the 2018 Chevrolet Bolt was the gear selector. Upright, situated between the two front seats, familiar P-R-N-D-L markings. That gear selector speaks volumes about what this electric car is trying to be. No buttons, no stalk off to the side like a Tesla or even a Toyota Prius, no rotary knob. The Bolt’s gear selector looks like something you’d find on any modern car, because that’s what everybody knows and understands, even though this single-speed electric car hardly needs it. It’s one of many examples of how this car wants to help usher in the electric car revolution by being, well... normal. 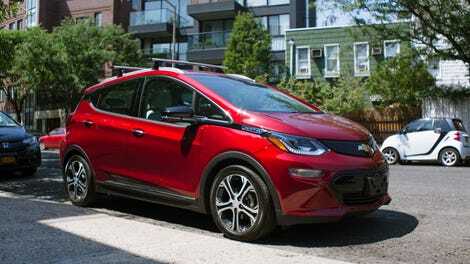 The Bolt is General Motors’ first serious attempt at a modern, mainstream volume-selling electric car after years of making various hybrids. Yeah, there was the Chevrolet Spark EV before this, but with a range of only 82 miles it was too limited to be your only car, the way the Bolt wants to be. Range is a big selling point here: 238 miles. It’s not as impressive as the Long Range Tesla models rated for over 300 miles, but on par with the much more expensive Jaguar I-Pace. In a week of ordinary city driving, it was tough to put a dent in that range. It’s a quasi-crossover hatchback thing, taller than your average hatch but not as huge as a true SUV, though it is surprisingly roomy inside. It’s also surprisingly kind of fun to drive, even if that’s hardly its primary mission. Charging is easy too; you just plug it in, wait for the confirmation light and go. On a standard Level 2 charger (I expect most owners will have one at home), it’ll get 25 miles of range back per hour, and on the DC fast charging public stations, it can add about 90 miles in 30 minutes. Part of the thinking behind the Bolt is most people generally don’t drive more than 40 miles a day, and so most owners won’t be running their batteries down to zero all the time. So it is in theory possible to snag one of these for under 30 grand when the credit’s figured in, though most for sale I’ve found are more expensive than that. Not bad on paper. And it turns out, not bad in real life, either. The Bolt’s awesome at just being a car. It was interesting to drive this nearly back-to-back with the Tesla Model 3 Performance, a car I really enjoyed spending time with. The difference in philosophy couldn’t be more stark. The Tesla, perhaps to a fault at times, tries to reinvent the wheel even when it doesn’t need to, with its phone-app door unlocking, buttons to unlock doors, ultra-minimalist interior and many key functions relegated to a touch screen. The Bolt takes the opposite approach. Anyone could get into this EV and figure it out. In fact, if you put a totally car agnostic person into it, they may not even realize it’s electric. Not at first, anyway. I loved the Bolt’s big, bright digital dashboard and the huge touch screen inserted tastefully into the dash. The latter looks really nice, with classy fonts, eye-pleasing graphics, quick responsiveness and menus that are easy to navigate. It feels like you’re using a high-end tablet, and it’s definitely a cut above most infotainment systems. The Bolt’s pretty great on the gadget front, too. Like all General Motors cars it can be had with unlimited 4G LTE WiFi, and the speeds are excellent. Faster than the garbage WiFi at our office. I even edited some blogs and fired off some emails from the comfort of the back seat once. The car’s neatest trick is regenerative braking. You may be wondering what the “L” on that gear selector does on an EV, and here it enables full regenerative braking and true one-pedal driving. With it on, you don’t really have to use the brake pedal (except in emergencies of course). The car slows up when you lift off the accelerator as it recaptures energy for the battery. This is best for city driving and lower speeds and it works remarkably well. But! Then there’s a paddle on the left side of the steering wheel that does the same thing on-demand, whenever you want. Pull the paddle and the car engages regenerative braking; let go and it’s back to normal. Being able to instantly toggle that on or off in an instant—going into a turn, for example, or if traffic slows up ahead of you—with just your left hand is a great little benefit. The Bolt’s definitely not much to look at from the outside. I mean, it’s fine. It’s not ugly, but it’s not distinctive or visually striking in really any way. It could easily be mistaken for any other hatchback or small crossover. This tracks with the normalcy GM was going for, but I think a bit more visual flair wouldn’t have hurt. The biggest letdown is the interior, which while roomy, is extremely blah. The Model 3 may be ultra bare-bones, but at least it’s a premium-feeling place to spend time. The Bolt’s economy car roots really come through on the inside. The dash is made of this hard, plasticky white textured material that looks more like styrofoam than anything else. All of it feels like a cut-rate knockoff of the BMW i3, without any of the coolness. The seats were similarly disappointing. They’re flat in the back and bottom and feel especially thin-padded, so I never really got comfortable in them. I feel like extreme-distance road-tripping would be quite a punishment for your back. Speaking of, it must also be said that until GM rolls out its recently announced network of Extreme Fast Chargers, the Teslas have the clear advantage for distance driving and road trips. Basically, with no Supercharger-type network, the Bolt is going to have its headaches with long-distance driving. The Bolt’s got the range, but it doesn’t have the backup yet. Seat gripes aside, the Bolt’s a pleasant and even rewarding car to drive daily. It’s best when you think of it as a city car plus: definitely meant to be an electric commuter, but with far less anxiety about your range than the 80-mile EVs that seem to only exist to satisfy California regulations. 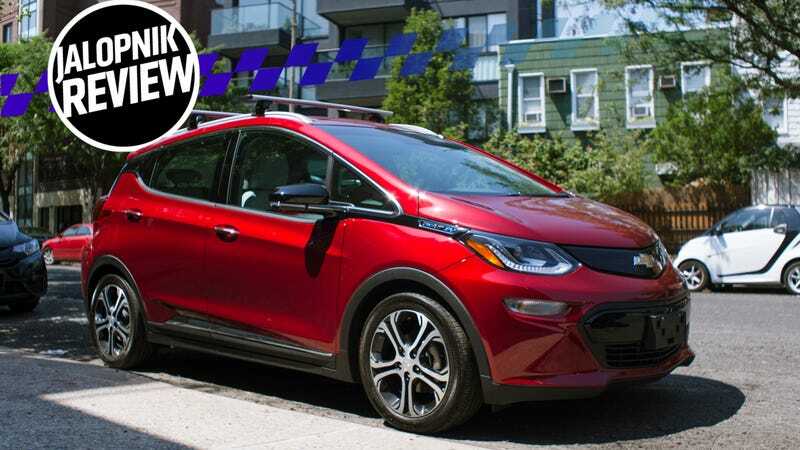 I drove the Bolt from my neighborhood in Brooklyn to Gizmodo Media’s offices near Union Square Park every day I had it, a commute that’s only about six miles one way. (And it usually takes 40 minutes to an hour, because New York.) I never once got concerned about range during those drives; indeed, I had to make a special trip out of the city to really use up some of that 238-mile full charge I was given. Even in the city, it’s pretty fun to drive. It has enough juice that you can pass and dart between other cars when you need to with ease, and it’s small enough that it’s remarkably easy to park. The ride quality’s great, and it’s so quiet inside that it’s actually quite calming to operate. A great insulator from the chaos and noise of the city for sure. I enjoy engine sounds as much as the next speed freak, but the Bolt’s the easiest car to have a room-volume conversation in I’ve experienced to date. Initially I was kicking myself for driving this right after our brief stint in the Model 3 Performance. Of course the Bolt doesn’t have the intense, almost scary acceleration that car has. Why would it? Not all EVs are the same, and this one’s also half the price of that. But the Bolt isn’t slow. It isn’t some golf cart. From a stop, if you stand on the accelerator you even get an eye-opening amount of torque steer. The zero to 60 mph is said to happen in a respectable 6.5 seconds, and I have no reason to dispute this. You won’t hold anyone up in this thing. In terms of how it feels to drive quickly, it’s somewhere between a standard Volkswagen Golf and a GTI—not crazy quick, but also not boring. The Bolt has a sport mode as well, and with that engaged it feels surprisingly eager. In terms of handling, it benefits from its compact size and having all the weight of the battery all in the floor—no engine to throw off its balance. It’s got a bit of body roll when you throw it hard into a bend, but it stays pretty flat. Again, better than you’d expect. Here’s where things got tricky: My attempts to charge a Bolt in New York City ate the better part of a single day and proved to be pretty maddening, but the car wasn’t at fault for that. After running the battery down to about 75 miles of range left, I brought it to a garage near our office at 10th Street and Seventh Avenue, guided by the PlugShare app. No good. Only the Tesla chargers were operational—and those don’t work with a Bolt—while the rest were broken. I paid for a day at a second garage closer to the office, and it was charging when I left it that morning, but when I returned around 8:30 p.m. it wasn’t charging at all. The attendant was bewildered. Their elevators were also broken, so I suspect it was a problem with the building. My next stop was a fast charging station at a Whole Foods (of course it’s at a Whole Foods, right?) in Gowanus, Brooklyn, not far from where I live. But the ChargePoint chargers and the access card included with my loaner didn’t get along. No luck there either. Finally, I ended up stashing it overnight at another garage near the grocery store, and—lo and behold—when I returned the next morning the car had a near-full battery. I had to teach the attendant how to do it, but still. Success! Finally. To be sure, it was a frustrating day. But it’s critical to note my experience won’t be typical of that of most Bolt owners. Odds are they’ll be able to fast-charge at home, at their office if they’re lucky, or they’ll have spots near either they trust for charging. I’m confident that if I had the Bolt another week, I wouldn’t have had any issues. I would have just parked it overnight again at that one garage, or found a reliable one closer to the office. But in New York City, you’re always at the mercy of other people, and that goes double for EV charging. The Bolt starts at $36,620. Our tester was a Bolt Premier, the better of the two trims available, which starts at $41,780. The Premier includes leather seats and a variety of lane change and parking aids. With options like that sweet roof rack, our car came to $43,905. All of that is before the $7,500 EV tax credit, which would bring its “true” price to $36,405. Here’s the thing: At that price, about the average new car transaction price these days, the Bolt’s a solid deal. But with the bland seats, the econo-hatch looks and the decidedly not premium interior, the Bolt is not a mid-$40,000 car. It just isn’t. If you want one of these, do yourself a favor and get it before the credit expires. When it does, Chevrolet is going to have to drop the price, make it more premium somehow or shift over to some electric crossover SUV thing that’s similar under the skin but can justify the steeper price, the way all crossovers seem to do. In so many ways, the Bolt is a win. It’s priced well (as long as that EV credit exists), it’s fun enough, it’s practical and it’s easy to live with. You almost can’t ask for a better way to ease people into electric cars. Yes, charging was a pain, but I would have sorted it eventually, and most drivers won’t have to deal with New York City headaches like I did. I was kind of surprised that I came to many of the same conclusions about the Bolt that my colleague Kristen Lee did about the Tesla Model 3 Long Range she tested. (I was on vacation when she had that car, and I did not get to drive it.) Even if the Model 3 does some radical things with its design and interior, at the end of the day it’s trying to drive like a normal, range-anxiety-free car would, and the Bolt is attempting the exact same thing. I think that normal-ness is what the EV market needs most right now. And like Kristen, I’m not ready to have this as my only car, and not just for charging and range reasons. I’d miss engine noise, shifting gears myself and all the other irrational things I love about internal combustion cars. But there was something rewarding, even tranquil, about driving around in something I knew wasn’t contributing to air pollution, gas consumption and the climate shifts likely to finish us all of someday. Would the Bolt make a good daily alongside some old, weird, fun and terrible Jalop-mobile? You could do a lot worse than that combo. What Do You Want to Know About the 2018 Chevrolet Bolt?